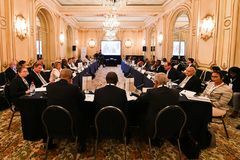 On 28 June 2018, upon official invitation, Mr. Ciopraga participated to the 29th Annual Session of the Crans Montana Forum in Brussels. The Programme of the meeting headlines included a number of major topics: the future of Eurasia region, Mediterranean and particularly, South-Eastern Europe at the doorstep of the European Union, Maritime and Port industry in the region of the Silk Road Countries and Africa, globalization and mobility, economic development and security challenges in Digital Era. It should be mentioned that the issue of strategic partnership of China with the neighbouring countries and beyond was in the focus of discussion. Participants of the meeting exchanged the opinions that nowadays Silk Road creates a new opening for all bordering counties and stressed the opportunities for deeper cooperation in the field of maritime transport in the presence of representatives of the port authorities and logistics key stakeholders. Maritime Silk Road of the 21st Century is part of a broader project which is called “One Belt and One Road” and, along with the Maritime Silk Road, it also consists of the Silk Road Economic Belt which connects China with Central Asia, the Arabian Gulf and Europe via land. The Maritime Silk Road, on the other hand, connects China with South East Asian countries, West Africa and reaches up to Mediterranean Sea. During the session “Maritime Silk Road and the development of Mediterranean and African Ports”, Mr. Ciopraga mentioned that the purposeful activities of the IGC TRACECA carried out together with the EU makes its constructive contribution to the development of interregional cooperation in the field of transport and transit. Special attention is paid to the development of ports along the TRACECA transport corridor. Sustainable functioning of maritime transport, safe and available carriage of passengers, quality delivery of goods – these are necessary prerequisites for regular activity of the society achieved owing to the maritime sector specialists. A port is the "gate" on the way to national economy, representing an active, advanced enterprise capable of satisfying trade, being competitive and providing the services needed by its partners. Among the most valuable projects recently implemented in the maritime sector there can be noted the following ones: commissioning of the first phase of construction of a new Baku Port in the settlement of Alyat. On 9 January 2018 there were commissioned two berths for receipt of RO-RO ships; In October 2017 there was officially commissioned the railway route Baku-Tbilisi-Kars, the shortest route for transportation of goods and passengers from China and Central Asia in the direction of Turkey and further to the countries of South-East Europe; There completed the first phase of a ferry terminal construction in the port of Kuryk (Kazakhstan). Its construction will also make it possible to considerably improve the transhipment of goods to the adjacent states of the Caspian region and further to Europe. Mr. Ciopraga underlined that continuation and enlargement of active and mutually beneficial cooperation among all concerned parties within the Crans Montana Forum is very important for the purpose of developing investment, economic and trade potential of the Eurasian region. 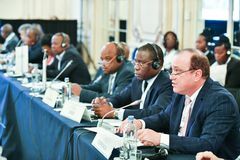 The 29th Annual Session of the Crans Montana Forum lasted till 30th of June. It should be noted that the negotiations on the Memorandum of Understanding between PS IGC TRACECA and Crans Montana Forum are still ongoing.